While small lifestyle changes to your diet and skin care can make a huge impact on your carbon footprint, implementing eco-friendly changes to your home can seem daunting. However, while you can make big changes, the smaller modifications do add up to make your home and your life less stressful for the environment. Here’s some big ideas and some small ideas to make eco-friendly changes to your home. When looking for storage solutions for your home, try to think outside the box. UK storage provider Safestore recommend thinking creatively to repurpose your clutter – for example, mount an old CD tower to the wall for an extra shelf for photographs and ornaments. 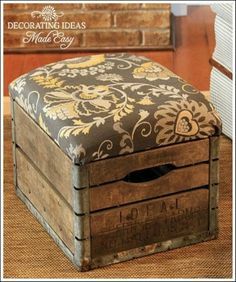 Wooden milk crates can also be used for storage – keep your shoes or gardening tools by the door, or nail a cushion to the lid for a comfy footstool and magazine rack. If you are shopping for wooden bookcases and furniture, look out for the Forest Stewardship Council’s logo, which certifies that the furniture has been made from reclaimed materials and not contributing to deforestation. According to Southern Electric, “up to 25% of the heat in your home is lost through the roof, and 35% through the walls,” in uninsulated homes, as the heat is lost in the cavities between walls. Investing in eco-friendly quilt insulation fills this gap to prevent air escaping. And if you still haven’t upgraded to double or triple glazed windows, it’s time to think again -the Energy Saving Trust calculated that upgrading to thicker windows could save homeowners up to £160 in heating bills per year. Both of these upgrades mean that you can afford to turn down the heater and air conditioning as the house is more efficient at keeping it – reducing your carbon footprint. A programmable thermostat is a small investment which improves the efficiency of your boiler, as you can control the level of heat for when you are at home or not. There are many minimal lifestyle adjustments you and your household can make to save electricity and water. For saving energy, invest in energy-efficient lightbulbs, and remember to switch off lights and unplug electronics that are not in use – phone chargers left plugged in cost Britain £28.9 million per year, according to research by Uswitch. Saving water is equally easy – don’t leave the tap running while doing the washing up, brushing teeth, or shaving, and only use the washing machine for a full load of laundry. Water-saving showerheads are easy to install by yourself and are cheaply available, and water conserving devices are available for toilets too.